THE definitive book for food safety training and certification. Updated to the new 2013 FDA Food Code, the new ServSafe ® Manager Book, Revised, 6/e continues to be ideal for courses that cover the basics, condensed courses, continuing education, and even 1-2 day seminars. The updated book will help readers prepare for the most current ServSafe Food Protection Manager Certification Exam, and more importantly, it will promote adherence to food safety practices on-the-job. Food safety has never been more important to the restaurant industry and its customers. Based on the 2013 FDA Food Code, the ServSafe Manager Book, Revised focuses on the preventative measures to keep food safe. To better reflect the changing needs of a diverse and expanding workforce, food safety topics are presented in a user-friendly, practical way with real-world stories to help readers understand the day-to-day importance of food safety. The streamlined delivery of food safety content will create a learning experience that is activity-based and easily comprehended by a variety of learners. The end result is content that is more focused, leading to stronger food safety practices and a better-trained workforce. Developed by the industry, for the industry, ServSafe ® is a proven way to minimize risk and maximize protection for foodservice owners, employees, and customers. Recognized as the industry standard, ServSafe offers a complete suite of printed and online products and is the most important ingredient to food safety training and certification success. The ServSafe Manager Book, Revised, 6/e is available packaged in a number of ways to suit your specific needs. ISBN: 013390847X is a package containing the book and the online exam voucher: ServSafe Manager Book with Online Exam Voucher, Revised, 6/e. Stand-alone book: ServSafe Manager Book, Revised, 6/e ISBN: 0133908399. A package containing the book and the answer sheet for the pencil/paper version of the ServSafe Food Protection Manager exam: ServSafe Manager Book with Answer Sheet, Revised, 6/e ISBN: 0133908372. A package containing the book, the answer sheet for the pencil/paper version of the ServSafe Food Protection Manager exam, AND MyServSafeLab with Pearson eText Access Card: ServSafe Manager Book with Answer Sheet, Revised Plus NEW MyServSafeLab with Pearson eText -- Access Card Package,6/e ISBN: 0134074432. A package containing the book and the online exam voucher: ServSafe Manager Book Revised with Online Exam Voucher 6/e ISBN: 013390847X. A package containing the book, online exam voucher, AND MyServSafeLab with Pearson eText Access Card: ServSafe Manager Book Revised with Online Exam Voucher, Revised Plus NEW MyServSafeLab with Pearson eText -- Access Card Package, 6/e ISBN: 0134074424. 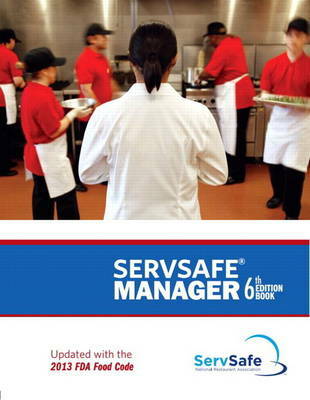 The ServSafe Manager Book, Revised is available packaged with MyServSafeLab ™. MyServSafeLab is an online homework, tutorial, and assessment program that truly engages students in learning. It helps students better prepare for class, quizzes, and exams-resulting in better performance in the course-and provides educators a dynamic set of tools for gauging individual and class progress. Students, MyServSafeLab is not a self-paced technology and should only be purchased when required by an instructor. Instructors, contact your Pearson representative for more information.